The combination of sweet apple jelly and spicy mustard accents the flavor of this roasted ham with a unique savory-sweet taste. 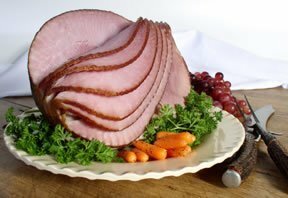 Preparing a spiral ham, which creates its own slices, makes it faster and simpler to carve for your Easter dinner. Learn how to properly thawing your ham, find baking tips, and see how to check the ham for proper doneness. Our Ham Cooking Times Chart provides cooking times for different types of ham when baking, grilling, and for baking with an oven bag.